The land just north of Cicero, Illinois, but still within the Township of Cicero, was purchased in 1865 by Henry W. Austin, a prominent businessman, realestate broker and land developer. He soon began to plan, survey and develop the area calling it the Austinville subdivision of the Township of Cicero. Slow but steady development occurred during the 1870s and 1880s. By the early 1890s, the area was growing fast and becoming more heavily populated. The Township of Cicero even chose to locate their township hall in Austinville. 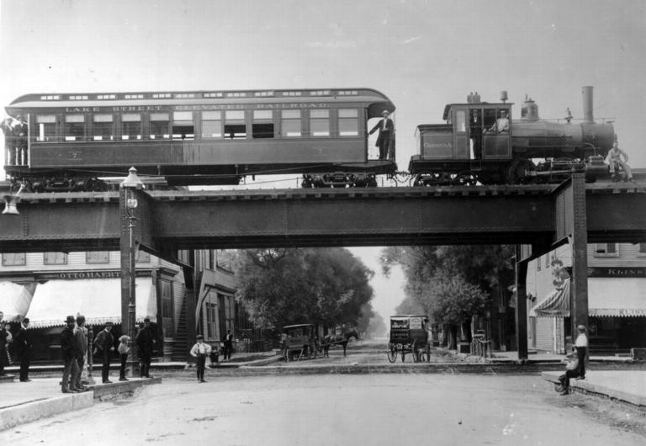 In the mid 1890s, the Austinville subdivision agreed to allow the Lake Street Elevated Railroad to extend their rail lines through its boundaries and into the Village of Oak Park, thus facilitating additional growth. The residents of Cicero Township voted to allow the City of Chicago to annex the entire Austinville area in 1899 and therby Austinville became part of Chicago and became its westernmost neighborhood. Readily available transportation systems to complement the elevated railroad were essential to the early growth of the newly designated neighborhood of Austin. New stations in the Austin neighborhood were built along the rail line. 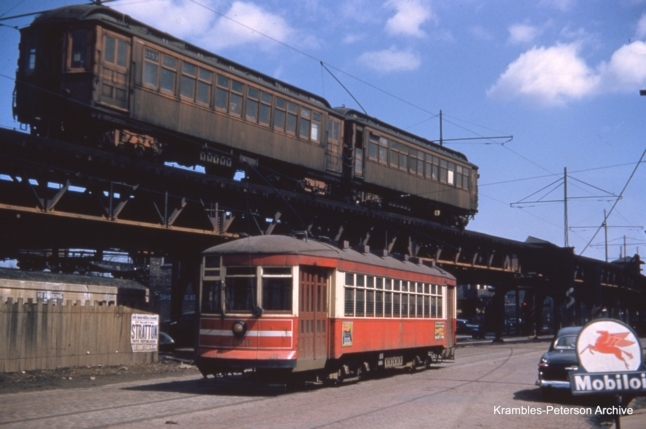 The early horse drawn surface commuter tram cars used to move people were gradually replaced by electric streetcars. Miles and miles of inset steel tracks were laid, criss crossing Austin along its major streets and avenues, further adding to its overalll development. 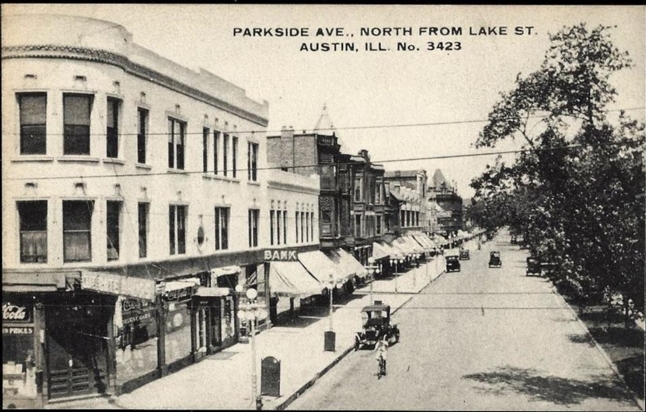 During the early 20th century, Park (later changed to Parkside) and Central Avenues from Lake Street north to Race Street and Central Avenue from Lake Street south to Fulton Street facilitated by the elevated line's Austin (at Central Avenue) Station became the focal point and commercial center of the neighborhood of Austin. 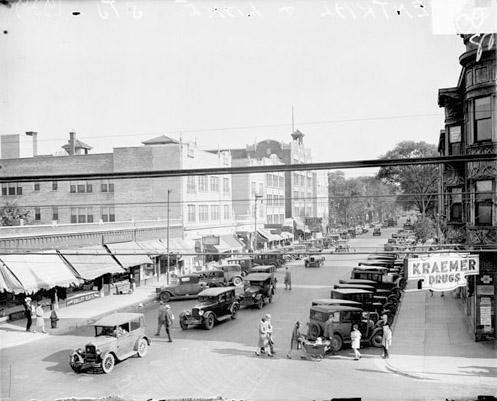 By the 1920s, Austin had grown to approximately 130,000 residents. The Austin Town Hall, facing Lake Street between Central and Parkside Avenues and modeled after Philadelphia's Independence Hall along with the Austin Branch of the Chicago Public Library located directly north and facing Race Street were both completed utilizing the same exterior building materials and were both dedicated in 1929. Together they became architectural landmarks and focal points for the community. Austin's population peaked during the 1940s at just shy of 140,000 residents. From the 1930s through the 1950s, Austin was the largest neighborhood by population of the 77 officially designated areas of Chicago. During the period between the 1920s and 1970s, the Austin neighborhood was officially designated to include that area from the Belt Line Railroad tracks at Kenton Avenue on the east to Austin Boulevard on the west and from Roosevelt Road on the south to North Avenue on the north, encompassing a total of 51/4 square miles. The population of Austin began to decline during the 1960s and the 1970s and it presently has approximately 95,000 residents. High school level classes were first offered to residents of Austinville in the 1870s in one room of a brick school house called the Ohio Street School located at the northeast corner of Park (later changed to Parkside) Avenue and Ohio (later changed to Race) Street. The first high school graduation class in 1876 consisted of 2 students. Enrollment was sparse and remained low until the first and original Austin High School building was constructed and opened in 1890. It was located between Fulton Street and West End Avenue, just west of Long Avenue. 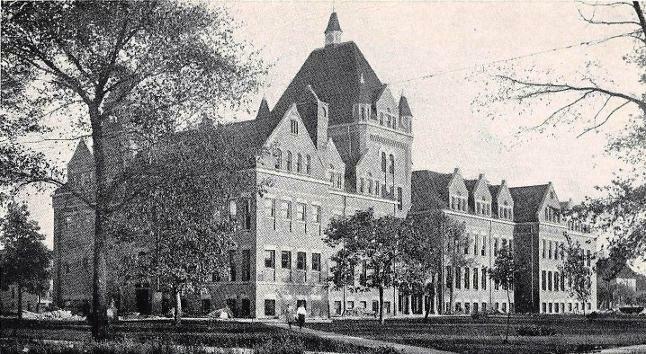 Starting with 72 students in 1890, enrollment steadily increased through the early 1900s forcing the original building to be expanded by adding several different additions in 1898, 1906 and 1915. When mobile classrooms became too numerous and impractial to handle the growing enrollment, construction of a second building began in 1927. 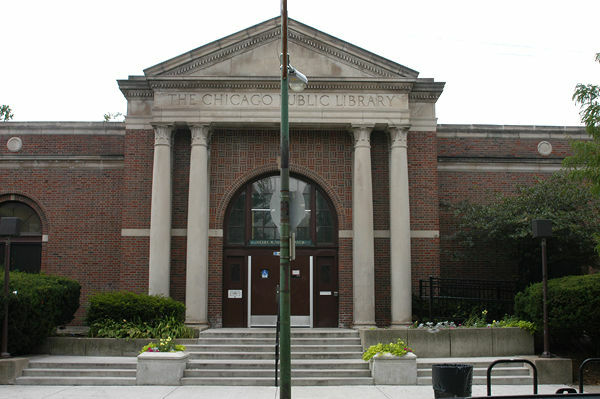 This substantially larger new building was dedicated and opened in 1930 just west of the original building and given the address of 231 North Pine Avenue. 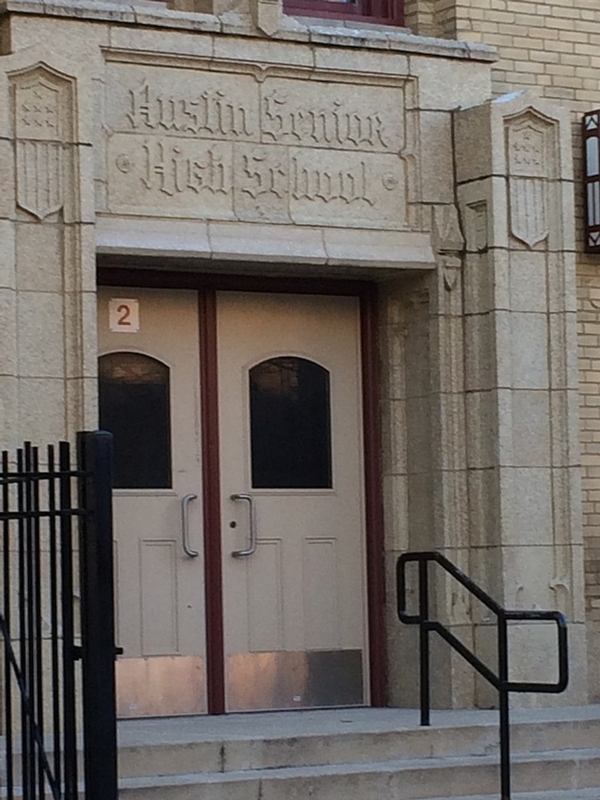 Austin High School operated as a two-building facility for the next 28 years consisting of the older East Building and the newer West Building in a campus like setting with a tunnel connecting both buildings. This two-building campus covered the entire city block between Long and Pine Avenues and Fulton Street and West End Avenue. 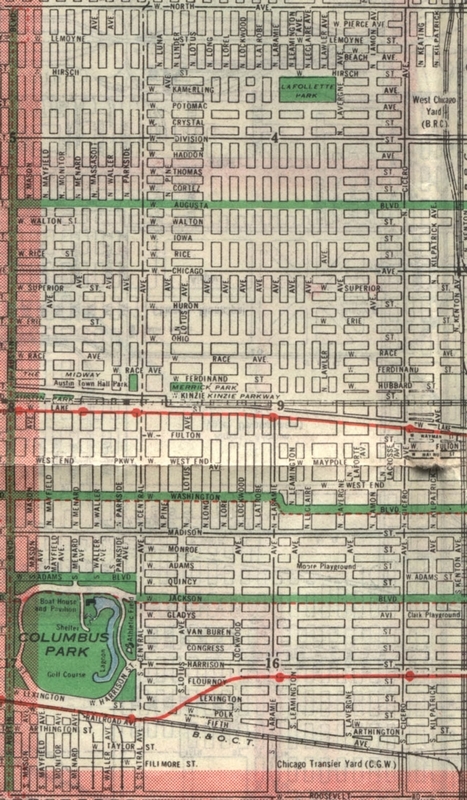 During the years it operated as a two-building facility, the boundaries were also increased to encompass not only the official Austin neighborhood but also the area between Roosevelt Road and North Avenue from the Belt Line Railroad tracks east to Crawford (later renamed Pulaski Road) Avenue, thus including portions of the West Garfield Park and West Humboldt Park neighborhoods. These extended boundary lines increased the attendance area to 71/2 square miles. The school enrollment with the two buildings remained steady during the 1930s and 1940s at between 7,000 and 8,000 students. 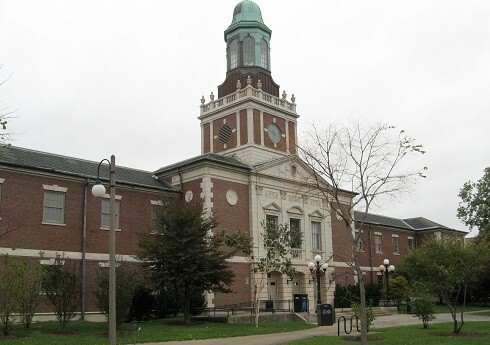 A freshman branch located at John Hay School and a specialized curriculum branch located at Rezin Orr School became necessary in 1927 and lasted until 1941 to help accommodate this large student body. 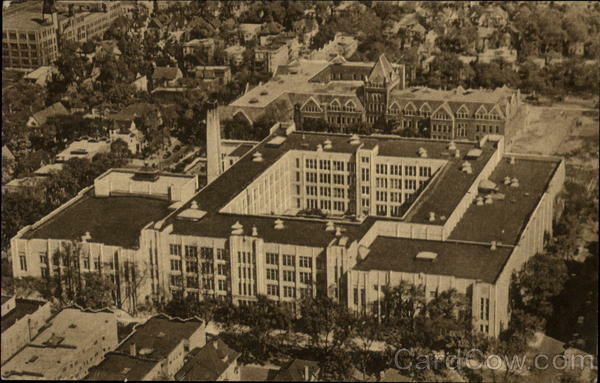 The 1937 Maroon and White yearbook was dedicated to, "the Largest Coeducational High School in the City of Chicago." Isolating the Austin neighborhood as its own entity, it was larger than any other city, village or township in the state at the time, so its namesake high school was more than likely also the largest in the state of Illinois and probably one of the largest in the United States. 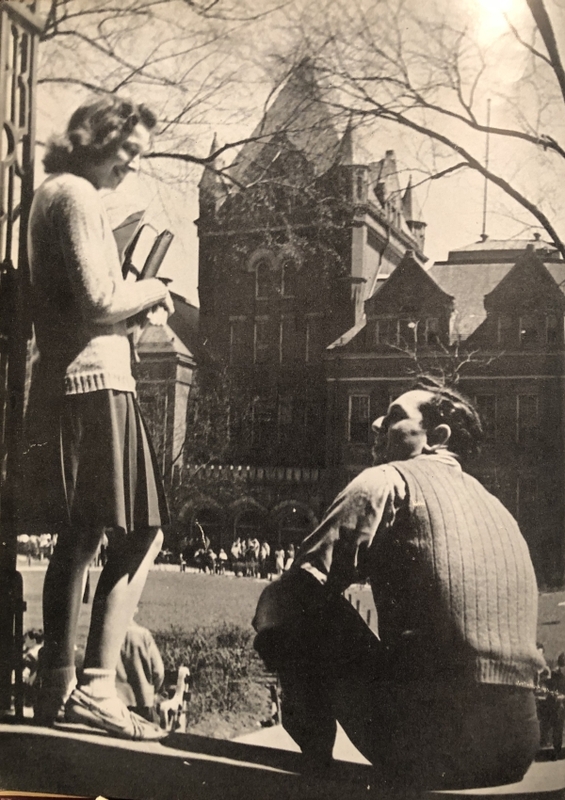 Published at the onset of World War II, the 1942 Maroon and White yearbook was dedicated to, "all recent graduates and those current students who are presently serving in our armed forces and defending our nation while at war". The older East Building was torn down in 1959 with the land turned into athletic fields and a parking area. Austin High School once again became a single building facility. The boundary lines were also reduced at this time, eliminating the West Garfield Park area from the Belt Line Railroad tracks east to Pulaski Road and from Roosevelt Road north to Chicago Avenue. Enrollment steadily declined during the 1950s and early 1960s to approximately 3,000 students by 1965. 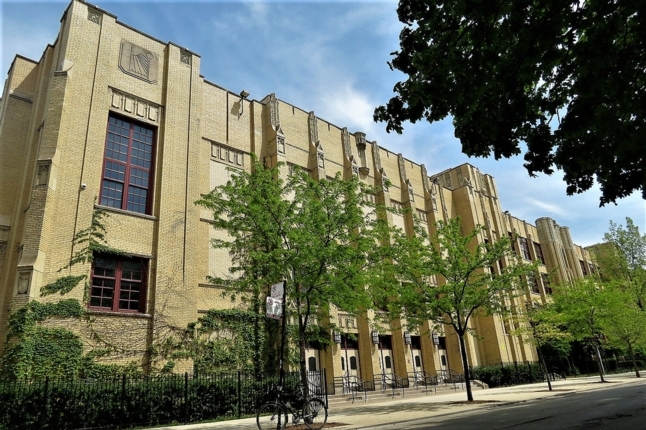 A changing neighborhood, loss of population and increasing violence caused the Chicago Public School system to begin the phasing out of Austin High School. 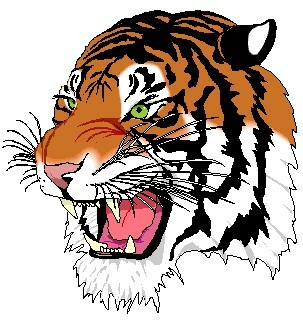 No incoming freshmen were admitted in 2004 and with the 2007 graduation of approximately 200 students, this phasing out was completed and Austin High School ceased to exist. The building was closed, repaired, refurbished and then reopened in 2010 to include four separate educational and career learning branches. It was again rechartered in 2016 and became the Austin College and Career Academy High School, composed of three educational and career learning branches attended by approximately 250 students.